Like most quilters, I have a mile-long list of projects I want to do. Some quilts are ideas for specific people, some are a particular pattern, and some are unique quilt-ish projects. Something that's been on my list for a ridiculously long time is a wheelchair quilt. 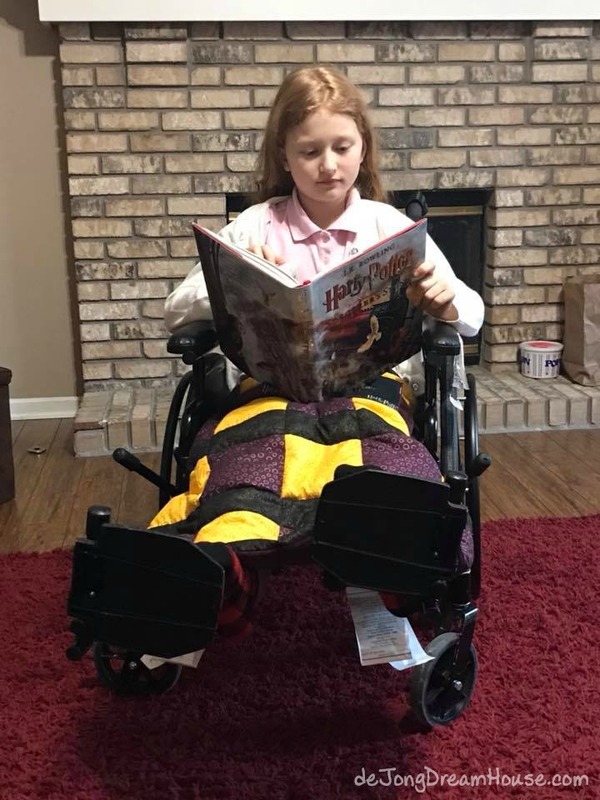 The opportunity presented itself a few weeks ago when one of D's friends injured her knee and needed a wheelchair (fortunately, only temporarily). 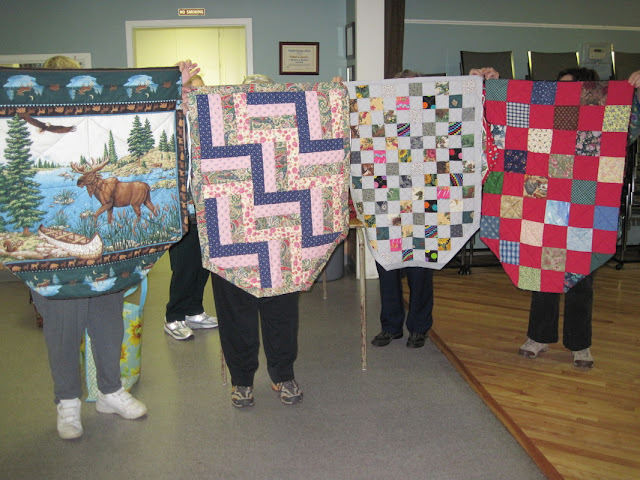 It was a low-stress opportunity to figure out how to make a child-size wheelchair quilt. As far as a pattern, I drew inspiration from a few different sources. I learned from Home Sewn By Carolyn that, in addition to their smaller size, it's helpful to taper the end of the quilt to prevent it from getting caught in the wheels. 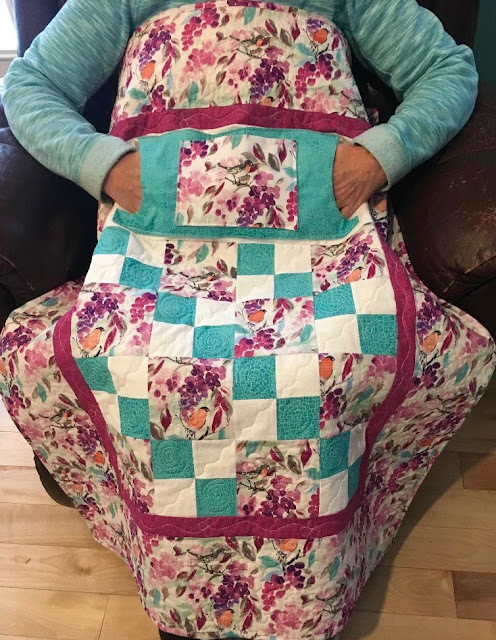 She has posted a free tutorial for adult size wheelchair quilts. Because it is winter in Ohio, I loved her idea of adding a hand warmer/pocket to the quilt. She sells the pattern for the pocket quilt on her site. Finally, I wanted to make the quilt weighted. I've made a very small weighted lap quilt, using the instruction from Susan Sullivan's book, Weighted Blankets, Vests, and Scarves. Niels really wants a full size one, but I haven't had to confidence to make one for him yet. Weighted blankets are heavy! I used minky on the back and on both sides of the hand warmer so it would be extra cozy. All in all, I'm pretty happy with how it turned out. I'll show some photos of the process below, but only the parts where I veered from the instructions in the book and online directions. Here is the top. I used minky for the 3 squares under the hand warmer. Weighted quilts are layered differently than regular quilts so I made a little mini one to make sure I didn't mess up the real thing. I found it easier to use basting spray to attach the top to the batting, then putting the right sides of the front and back together. I sewed up three sides, leaving the top open to put the poly pellets in. I meant to topstitch the three sides before putting the pellets so I could add a binding, but I forgot it. Next time. I chose the square so I wouldn't have to mark lines for the channels. I just stitched in the ditch. For the poly pellets, I guessed C's weight. I divided the total by 10 and added a pound. Then I added the total number of squares and divided it by the total weight in grams so that I would put an equal amount of pellets in each one. That would have worked perfectly except that some of squares were not squares! So I had to made some mid-course adjustments. Because the bottom row was so full, I definitely couldn't topstitch after the fact or put on the binding I had planned. I attached the handwarmer after the pellets were stitched in by carefully top stitching the top and bottom as I smoothed away any stray pellets. I didn't add a pocket on top of the handwarmer because I didn't want to take away from the Harry Potter print. With minky on both sides, I think it will be a great hard warmer. D is about the same height as his friend, so he was happy to be my model as I guessed the length and width. I purposely made the quilt short enough not to cover the feet so they wouldn't get the edge of the quilt dirty, but if I made another, I think I would go ahead and add one more row. All in all, this was a good learning experience. The weighted quilt part of it definitely takes away from the creative aspect of quilting I most enjoy, but I am satisfied in adding a new skill to my wheelhouse. 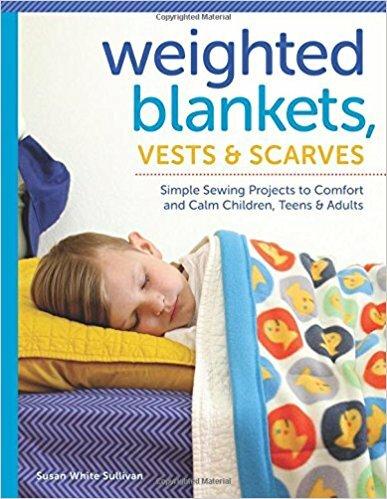 And maybe, just maybe, Niels will finally get his weighted blanket!